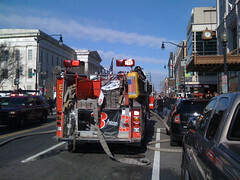 There is a fire response in progress at 7th and F street across from the Verizon center. Currently, eight fire engines are in the immediate vicinity. No smoke is currently visible coming from the Terrell Plaza building, but at least four different firehouses have responded. The building has been evacuated, including the Rosa Mexicano restaurant on the ground level.